Whether quietly paddling through the still waters of Mirror Lake or shouting at full volume as the kayak's nose cuts through whitewater rapids, canoeing and kayaking around Park City is a sure-fire summer activity. Take the entire group down the Weber River with its class III rapids, passing by the base of Mount Timpanogos. Found just east of Kamas, Mirror Lake is a pristine, calm water in the heart of the Wasatch National Forest. Jordanelle and Rockport Reservoirs are larger lakes, popular with boaters and fishermen. In the reservoirs and lakes of the surrounding national forests, paddlers will find plenty of opportunity to get out. 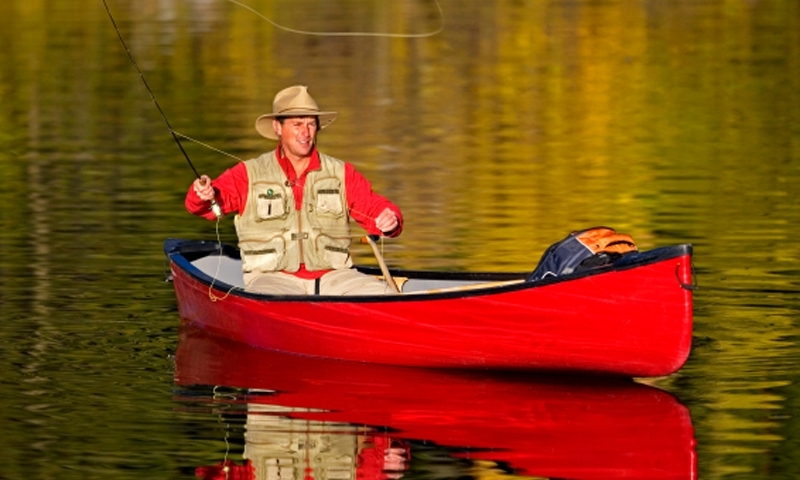 There are large lakes popular with boaters of all variety and there are small lakes, secluded and serene in nature. While the whitewater might not be the raging class V rapids that people sometimes crave, it is nonetheless an excellent adventure for families and groups, enjoyed by people young and old. This is a perfect whitewater river for families and groups of all experience levels. Passing by the 12,000-ft. Mt. Timpanogos and under historic train bridges, this trip is generally about two hours long. The class III rapids are perfectly sized to have some thrills, but they are not technical or aggressive, so everyone can relax and have fun. Solo or double inflatable kayaks are available to rent from the guiding companies. Sunset tours are popular trips, and, when possible, a moonlight tour is offered as a different way to experience the river. The cool summer temperatures and remote location make canoeing on this lake a pleasant experience. You may share the water with some fishermen, but the campground on the shore is a great place to spend the night after a day out paddling the water. To get to Mirror Lake, head towards Kamas on UT-248 (named Kearns Blvd in Park City). In Kamas, head east on UT-150, which is closed in the winter. Mirror Lake is located 30 miles into the Wasatch National Forest. Take note that there are many small lakes located in this area, just waiting to be explored. This large lake features two separate areas, with Hailstone acting as the main dock, and Rock Cliff presenting a series of interpretive boardwalks. A canoe ride around this area would give excellent glimpses of the wildlife hiding in the forested shore. Jordanelle is located 20 minutes from Park City, but just a few miles as the crow flies. Head out to US-40 and drive south, taking the Mayflower Exit. At 3 miles long and a half-mile wide, Rockport Reservoir serves as recreational water for boaters of all varieties. While there is other traffic on the lake, there is still plenty of water to enjoy on a canoe or kayak. Rockport is located 20 minutes northeast of Park City. Take I-80 East to South UT-32 at exit 155. The reservoir is less than a mile away. Canoeing and kayaking, particularly on whitewater, can involve logistical headaches involving transportation, food, beverages and directions, so explore the guiding companies below to find one that suits your needs. The Utah Whitewater Club is a local club that provides info on events, meetings, water flows, and trips. Utah Rivers Council is an organization dedicated to the protection of Utah's Rivers and the education of policies and water conservation. The Utah Rivers Council protects Utah's water sources and wildlife. Kayaking information for the Colorado River, near Moab Utah.